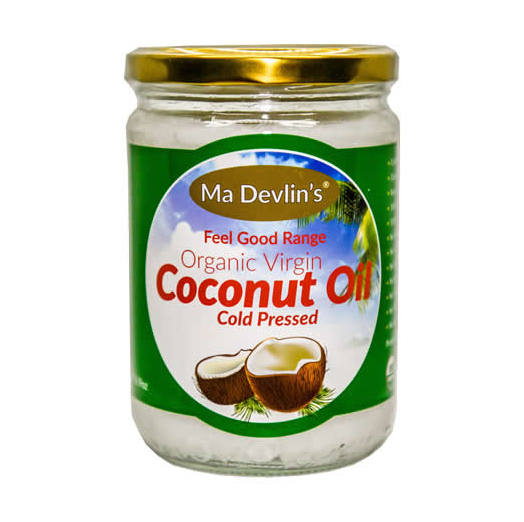 Ma Devlin’s Premium Extra Virgin Coconut Oil is different with an absolutely delicious taste and cold pressed from fresh coconuts without any heat during its production cycle this ensures the premium quality and freshness of the coconut oil. There is a number of uses and to many to mention, but here are a few, On the skin as a basic lotion, As an eye-makeup remover, Topically to kill yeast or yeast infections, On feet to fight athlete’s foot. The antiviral, antimicrobial and anti fungal properties of coconut oil may be beneficial to the immune system, helping to ward of viruses and bacteria. No cholesterol or trans fats its pure cold pressed oil great and is available 500 ml/1000ml Glass Jars. Take 1-2 tablespoons per day for best results. Excellent for cooking up to 350°F/176°C. Can be used as a dairy-free alternative to butter in baking and all of your favorite foods. Can be used as a luxurious body moisturiser. If stored below 23 oC the oil will solidify, at temperatures above this it will melt, this is a normal process and none of the goodness is lost during this process.